Your adventure is dedicated to the emperor's summer residence. 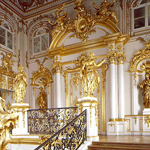 You will have ample time to browse the imperial Catherine palace, absorbing the magnificence and its unforgettable Amber room. Having served as the Tsar's summer residence, its grounds are dotted with countless fountains, monumental ensembles, and charming pavilions. Our guide will come to your ship. There also will be a driver waiting at your ship entrance. The tour is done by car/minivan. We use licensed drivers with cars (up to 3 people) or minivans (4 - 7 people). 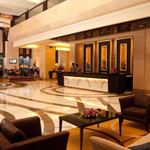 Transfer to the best known suburbs of St. Petersburg. This gem of Russian 18-19 century architecture used to be the favourite and most beautiful summer residence of the Royal family. The world-famous palace, fountain and park ensemble of Peterhof is an outstanding landmark that witnessed huge stratum of Russian history. Peterhof, one of the most visited Russian attractions, will win your heart with its romantic atmosphere and picturesque views. It is also an engineering state-of-the-art system as all the fountains work just like it was 300 years ago. 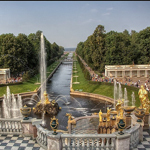 Peterhof, perhaps the most beautiful park residence in the world, contains 173 fountains, 3 large cascades and a number of Palaces. We gonna take you to the most beautiful one — the Grand Palace and show you the shiny cupolas and the beautiful East Chapel. 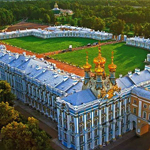 The spectacular parkland at Peterhof is remarkable for the sheer variety of styles encompassed in its layout and features. 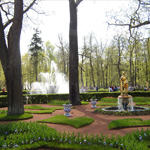 Representing nearly two centuries of European aristocratic fashion executed to the highest standards, Peterhof is like an encyclopedia of park design through the age of empire. 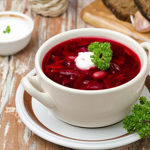 Transfer to Tsarskoe Selo is a town to the south from St. Petersburg. 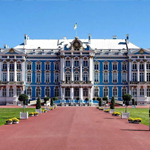 It was the main summer residence of the royal family, hence the name (Tsarskoe Selo means tsars village). The second name of the town is Pushkin. At the end of the tour we will take you back to your ship.